November 2017 – NASCAR and The Goodyear Tire & Rubber Company today announced a renewed, multi-year sponsorship agreement that ensures Goodyear is the exclusive tire of NASCAR’s top three national series. 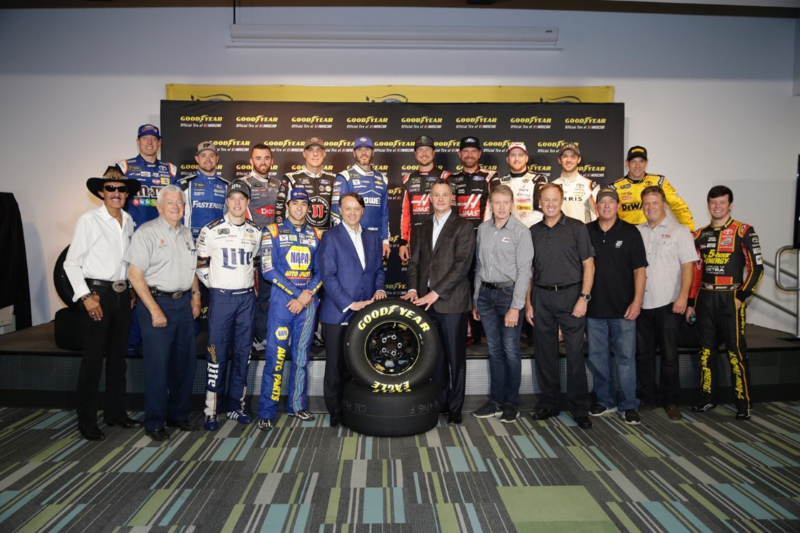 The newly signed agreement continues Goodyear’s designation as the “Official Tire of NASCAR” and extends an uninterrupted relationship that started in 1954. Goodyear and NASCAR’s six decade-long relationship is one of the longest-running sponsor programs in any major sport. From the introduction of the racing slick in 1972 to the radial tire in 1989 to multi-zone tread design in 2013, Goodyear and NASCAR have consistently innovated to deliver compelling racing. NASCAR has served as a proving ground for Goodyear, preparing and supplying tires that meet the most grueling and demanding conditions. The technology that goes into a tire to withstand and perform in those conditions helps inform and differentiate Goodyear’s consumer tires. Goodyear produces more than 100,000 tires for NASCAR’s top three series every year and each tire is custom-built by the hands of passionate Goodyear associates in Akron, Ohio – Goodyear’s global headquarters – and donned with the name of the employee who helped produce it. The depth of the relationship has been built on competition, shared passion and brand growth for the two organizations. Goodyear’s industry-leading brand has been amplified through the duration of the relationship generating awareness for the tiremaker with NASCAR’s passionate fan base. For five consecutive years, Goodyear has been the most-recognized sponsor in NASCAR, according to the 2016 NASCAR sponsor loyalty survey conducted for SportsBusiness Journal/Daily by Turnkey Sports & Entertainment. international series. The International Motor Sports Association™ (IMSA®) governs the IMSA WeatherTech SportsCar Championship™, the premier U.S. sports car series. Based in Daytona Beach, Fla., with offices in eight cities across North America, NASCAR sanctions more than 1,200 races in more than 30 U.S. states, Canada, Mexico and Europe. For more information visit www.NASCAR.com and www.IMSA.com, and follow NASCAR on Facebook, Twitter, Instagram, and Snapchat (‘NASCAR’).